Charging multiple battery banks without use of diode isolators dictates that the batteries be connected or “integrated” only whenever a charge voltage is present so that they may be charged simultaneously, then disconnected or “isolated” when in use to allow for selective discharge and avoid having the secondary or standby battery drain into the primary battery. 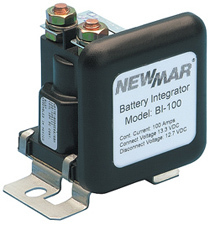 Battery Integrators perform this function automatically, acting as a “smart” switch to connect independent battery banks only when a charging voltage is present. Otherwise, they are isolated, and discharge between banks is prevented. The Battery Integrator causes no voltage drop in the charging system, while the multiple batteries are charged as a single bank whenever a charging source of approximately 13.2 VDC or 26.4 VDC or greater is present (depending on model). When the alternator or charger is off or a large load causes the voltage to drop below the disconnect point the unit breaks the common tie between the banks. This allows selective battery discharge and prevents “dumping” of a higher-charged bank into a lower-charged bank. The unit may also be activated to connect other batteries through the key starter or a manual switch to provide an added “boost” from the secondary battery whenever the starter is engaged and the unit senses there is sufficient voltage in that battery to provide an assist. For systems with more than two banks, an isolator must be installed for each additional bank to provide the same isolation and integration as described above. Dimensions (H x W x D): 3" x 3.25" x 2.5"